Raising rabbits can be a fun, rewarding experience that anyone can do with a little time and patience. Its main benefit is that it guarantees a safe steady supply of healthy meat that doesn’t taste too bad either. Compared with other types of meat, rabbit meat is lower in cholesterol and fat, while having a higher proportion of digestible protein. 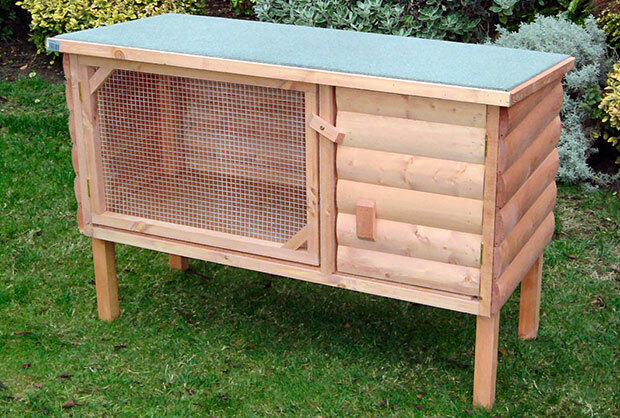 Rabbit farming can be done even if you have limited space for breeding, since rabbits are kept in hutches that can be stacked. Rabbits also require little attention compared with other livestock animals and can be sustained on a fairly simple diet. Rabbits survive mostly on moist vegetable greens such as spinach, kale, lettuce, parsley and broccoli. Even herbs such as tarragon and mints will do the trick. Add starchy vegetables like carrots in moderation and small amounts of fruit and you have yourself a complete rabbit diet. You can also purchase commercial pellets to feed them, but they should still get some of the fresh stuff. The first step in raising rabbits is to choose the right breed of rabbit. New Zealand White and Californian are among the most popular breeds chosen by those who are interested in breeding rabbits for their meat and fur. The New Zealand White bucks weigh around eight to ten pounds while the female does weigh on average 9 to 12 pounds. They are specifically bred for their meat and fine fur. Does are fertile all year long and have a gestation period of around 1 month, with the average number of kits per litter being around six, although they can have as many as twelve. New Zealand Whites can reach fryer size in about two months. Californians weigh around seven to twelve pounds and have a predominantly white body with black coloration on their feet, tail, nose and ears. They are considered an excellent breed for those who breed rabbits for meat because they can have litters of as many as eight to twelve kits, and can grow to fryer size of four to five lbs in just eight to twelve weeks. When starting out in rabbit breeding, don’t make the mistake of getting too many rabbits at once since they can reproduce very quickly. To avoid this, it’s recommended that you start with just one buck and three does. To make the cost of breeding rabbits worth it, each of your does should produce at least thirty six fryers a year or six liters of at least six kits each. Once your does start breeding they should be separated and have their own wire cages. 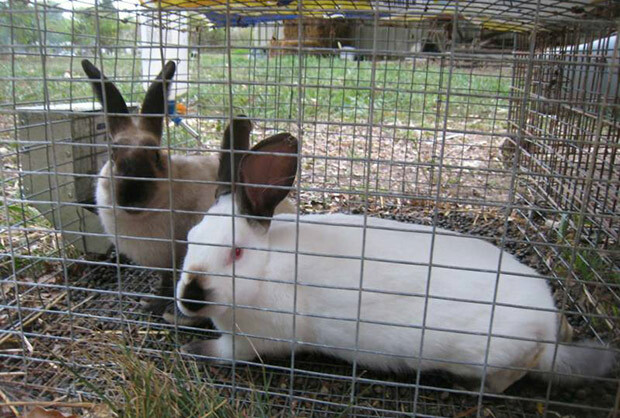 The cages used for raising rabbits should have at least six square feet of space and be eighteen inches in height. The cages should have hard plastic or rubber mats on the floor in order to prevent your rabbit’s feet from being injured. The hutches should also be cleaned on a regular basis in order to prevent the spread of disease. It’s recommended that you use a commercial feeder with perforated bottoms that will filter out the fines in rabbit feed and provide them with a regular source of clean water. Water bottles can be used during warm weather or you can buy commercially produced automatic water dispensers. Rabbits can endure cold weather better than warm so if you are raising rabbits in hot weather you will need to cool them down when the temperature gets too hot. Anything over ninety degrees will start causing problems that could result in your rabbits dying. You can try placing two liter bottles filled with ice or cold water into the cages and make sure to shade them from the direct sun. Raising rabbits can have its challenges, but once you get over the initial hump of figure out how things work and understanding the little nuances, breeding rabbits can be a fun, low time consuming way to always have fresh meat ready to go! If you sync up with local farmers, you can ask them for their throwaway (bug-eaten, oversprouted, unpurchased) carrot tops, lettuce, fennel, and anything else that fits on the ok-for-rabbits food list. This way you don’t need to buy factory feed, and most will give this to you for free! FREE BUNNY FOOD.